After six months of gains in which the gold price rose by $175 per ounce to $1,345, March saw some profit-taking. Gold fell to its monthly low of $1,280 on March 7 amid near-term U.S. dollar strength. However, the gold market quickly reversed course when the U.S. Department of Labor reported non-farm payrolls increased by just 20,000, compared to median expectations of 180,000. On the same day, the European Central Bank (ECB) announced a policy reversal, offering cheap loans to banks and keeping interest rates at record lows for longer than planned. This caused recessionary fears to re-emerge as long-term treasury yields fell to 15-month lows, the yield curve inverted slightly for the first time since 2007, and gold trended to its monthly high of $1,324 on March 25. As the month ended, there was broad weakness among precious metals due to a sharp fall in palladium prices. There were also reports of heavy official selling from Turkey to prop up the lira ahead of local elections on March 31. Gold ended the month at $1,292.30 for a loss of $21.01 per ounce (down 1.6%). After about two years without reporting any purchases, the People’s Bank of China (PBOC) reported its third consecutive month of gold buying, with a February inflow of 9.95 tonnes. This suggests the Chinese are again consistent buyers, which bodes well for central bank demand in 2019. Gold stocks more or less matched gold’s performance in March with a 0.74% gain in the NYSE Arca Gold Miners Index (GDM) and a 2.3% loss for the MVIS Global Junior Gold Miners Index. First quarter merger and acquisition (M&A) activity among the supermajors has nearly reached a conclusion. Barrick Gold (7% of net assets) withdrew its hostile offer for Newmont Mining (6.2% of net assets) on March 11 when the companies announced a joint venture (JV) agreement to unitize their Nevada operations. Their combined Nevada operations produce four million ounces per year and Barrick, as JV operator, estimates it will generate about $5 billion in synergies. After years of debating such a deal, at the urging of shareholders, these two rivals hammered out a JV in just two weeks. Investors then turned their attention to the friendly Newmont/Goldcorp merger announced in January. It stood to reason that Goldcorp (2% of net assets) shareholders were not entitled to the Nevada JV synergies, which did not exist at the time the deal with Newmont was announced. Again, at the urging of investors, Newmont decided to award a 2.5% special dividend to its shareholders as a partial upfront payment for future Nevada synergies. The dividend will be distributed if the Newmont/Goldcorp deal is approved by shareholders in April. All of this supermajor M&A activity has been aimed at creating value for shareholders by combining companies, managements, and properties with the goal of mining more efficiently and generating higher returns on capital. We hope the majors, mid-tiers, and juniors are able to replicate what the supermajors have done. According to Pollitt & Co. Inc., just four companies account for 50% of iron ore production, while it takes ten companies to account for 50% of copper production. Contrast this with gold where twenty-five companies account for 45% of production. Mining is risky business and not all of these companies have an A-team. Management risk can be mitigated by joining good managements with good properties, thereby enabling companies to optimize operations. M&A also allows smaller companies to gain the critical mass needed to efficiently access capital markets and strike better deals for materials, equipment, and services. Successful investing involves making the right call at the right time. A great investment idea can fail if the timing is off. We have been warning of the risks of recession for several years. As such, our fund has been positioned aggressively for a stronger gold market. While gold and gold stocks have exhibited positive returns in two of the last three calendar years—driven, perhaps, by any number of the global systemic risks that currently exist—we were certainly much too early on the recession call. Two years ago we shared this chart as a compelling indicator of a coming recession. We update it here, and now find it even more compelling. 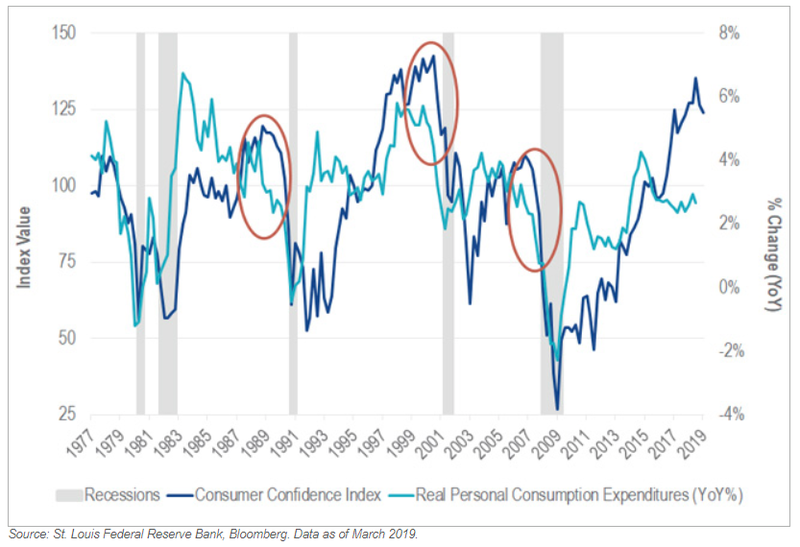 Notice the divergence between the “hard” consumption data and the “soft” consumer confidence data ahead of each recession. Sentiment remains strong before a recession, while actual economic indicators are weakening, and this time the divergence has become more pronounced. We believe this chart, combined with other late-cycle indicators, stock market volatility, bond market action, and central bank behavior all suggest a recession remains in the forecast and probably may occur sooner than many expect. If the economy tumbles into recession, we expect financial risks to escalate that drive gold higher. Federal debt totals about 75% of U.S. gross domestic product (GDP) and is growing rapidly. Trillion-dollar annual deficits were first seen in the Obama administration, and now President Donald Trump’s policies will again drive deficits through the trillion-dollar mark (4.5% of GDP) beginning in 2022, according to the Congressional Budget Office (CBO). Unlike in the Obama years, we rarely hear politicians complaining about the debt level. Spending more is easy, while cutting budgets seems politically impossible in Washington. Because of this, we believe a debt crisis is imminent, although the breaking point is difficult to forecast. It may come in the next recession, or at a time when rates spike as foreign holders of U.S. Treasuries lose confidence in Washington. If cutting spending is impossible, growth is weak, and raising revenue by hiking taxes even higher is limited, then we see only two options for handling U.S. debt: default or monetization. Any country that prints its own currency can do so to pay national debts or finance deficits. Deficits don’t matter as long as interest rates remain below GDP growth. The natural rate of interest in a fiat currency world is 0%. Inflation can be controlled through taxation, rate increases, and regulation of big business. Economies should be guided by fiscal policy, i.e., government spending and taxation. The Central Bank would essentially be controlled by the Treasury. Prominent economists and financial leaders have characterized MMT as “fallacious”, “garbage”, and “just wrong”. We agree with these characterizations and suspect that those reading this update intuitively understand why. If adopted, MMT would likely lead to currency debasement and hyper-inflation on a scale seen in Weimar Germany almost 100 years ago or in modern-day Venezuela. Bond prices might collapse with the U.S. dollar, and a financial crisis would probably ensue long before MMT is implemented in its full form. Unfortunately, there are fewer and fewer Americans who are familiar with the level of financial risk that we currently face (including even those within government-held roles at the highest levels). Furthermore, less than half of young adults now have a positive view of capitalism. According to a Deutsche Bank report, the percentage of Americans who say reducing the budget deficit should be a top priority has shrunk from 71% in 2013 to 48% in 2019. Amid this complacency towards debt, disdain of capitalism, and changing political ideas, it is not hard to imagine MMT gaining in popularity and acceptance as the next presidential cycle unfolds. Americans, regardless of political ideology, may find the lure of free money irresistible. In addition to purportedly taking care of our indebtedness, MMT can supposedly help pay for a progressive agenda of healthcare and employment for all, abandonment of fossil fuels, and free college tuition. What might be a more viable option? How about an investment in a reasonably valued, preexisting asset class with a proven track record as an alternative store of value and negative correlation to the U.S. dollar? For that, one need not look any further than gold and gold shares. *All company weightings, if mentioned, are as March 31, 2019, unless otherwise noted. Any indices listed are unmanaged indices and include the reinvestment of all dividends, but do not reflect the payment of transaction costs, advisory fees or expenses that are associated with an investment in the Fund. An index’s performance is not illustrative of the Fund’s performance. Indices are not securities in which investments can be made. NYSE Arca Gold Miners Index (GDMNTR) is a modified market capitalization-weighted index comprised of publicly traded companies involved primarily in the mining for gold. MVIS Global Junior Gold Miners Index (MVGDXJTR) is a rules-based, modified market capitalization-weighted, float-adjusted index comprised of a global universe of publicly traded small- and medium-capitalization companies that generate at least 50% of their revenues from gold and/or silver mining, hold real property that has the potential to produce at least 50% of the company’s revenue from gold or silver mining when developed, or primarily invest in gold or silver. Pollitt & Co. Inc. is a Toronto-based investment banking and brokerage services firm offering private placements advisory and securities dealership services to institutional and high net worth private clients. NYSE Arca Gold Miners Index is a service mark of ICE Data Indices, LLC or its affiliates (“ICE Data”) and has been licensed for use by VanEck Vectors ETF Trust (the “Trust”) in connection with VanEck Vectors Gold Miners ETF (the “Fund”). Neither the Trust nor the Fund is sponsored, endorsed, sold or promoted by ICE Data. ICE Data makes no representations or warranties regarding the Trust or the Fund or the ability of the NYSE Arca Gold Miners Index to track general stock market performance. ICE DATA MAKES NO EXPRESS OR IMPLIED WARRANTIES, AND HEREBY EXPRESSLY DISCLAIMS ALL WARRANTIES OF MERCHANTABILITY OR FITNESS FOR A PARTICULAR PURPOSE WITH RESPECT TO THE NYSE ARCA GOLD MINERS INDEX OR ANY DATA INCLUDED THEREIN. IN NO EVENT SHALL ICE DATA HAVE ANY LIABILITY FOR ANY SPECIAL, PUNITIVE, INDIRECT, OR CONSEQUENTIAL DAMAGES (INCLUDING LOST PROFITS), EVEN IF NOTIFIED OF THE POSSIBILITY OF SUCH DAMAGES. MVIS Global Junior Gold Miners Index (the “Index”) is the exclusive property of MV Index Solutions GmbH (a wholly owned subsidiary of Van Eck Associates Corporation), which has contracted with Solactive AG to maintain and calculate the Index. Solactive AG uses its best efforts to ensure that the Index is calculated correctly. Irrespective of its obligations towards MV Index Solutions GmbH, Solactive AG has no obligation to point out errors in the Index to third parties. The VanEck Vectors Junior Gold Miners ETF (the “Fund”) is not sponsored, endorsed, sold or promoted by MV Index Solutions GmbH and MV Index Solutions GmbH makes no representation regarding the advisability of investing in the Fund. Please note that the information herein represents the opinion of the author, but not necessarily those of VanEck, and this opinion may change at any time and from time to time. Non-VanEck proprietary information contained herein has been obtained from sources believed to be reliable, but not guaranteed. Not intended to be a forecast of future events, a guarantee of future results or investment advice. Historical performance is not indicative of future results. Current data may differ from data quoted. Any graphs shown herein are for illustrative purposes only. No part of this material may be reproduced in any form, or referred to in any other publication, without express written permission of VanEck. About VanEck International Investors Gold Fund: You can lose money by investing in the Fund. Any investment in the Fund should be part of an overall investment program, not a complete program. 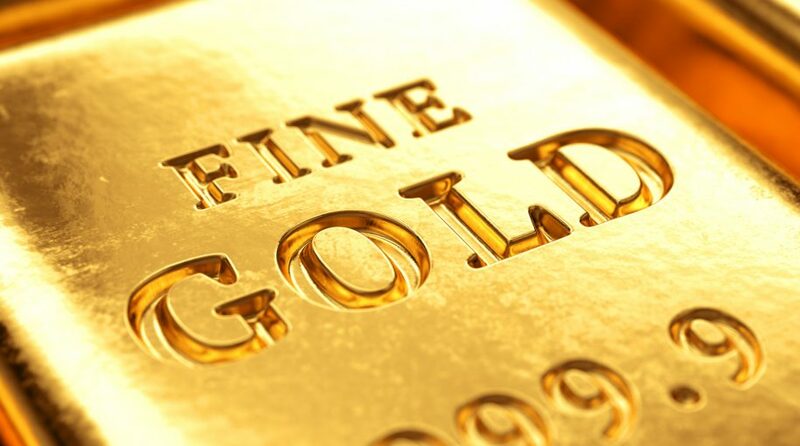 The Fund is subject to the risks associated with concentrating its assets in the gold industry, which can be significantly affected by international economic, monetary and political developments. The Fund’s overall portfolio may decline in value due to developments specific to the gold industry. The Fund’s investments in foreign securities involve risks related to adverse political and economic developments unique to a country or a region, currency fluctuations or controls, and the possibility of arbitrary action by foreign governments, or political, economic or social instability. The Fund is subject to risks associated with investments in Canadian issuers, commodities and commodity-linked derivatives, commodities and commodity-linked derivatives tax, gold-mining industry, derivatives, emerging market securities, foreign currency transactions, foreign securities, other investment companies, management, market, non-diversification, operational, regulatory, small- and medium-capitalization companies and subsidiary risks. About VanEck Vectors® Gold Miners ETF (GDX®) and VanEck Vectors® Junior Gold Miners ETF (GDXJ®): An investment in the Funds may be subject to risks which include, among others, investing in gold and silver mining companies, Canadian issuers, foreign securities, foreign currency, depositary receipts, small- and medium-capitalization companies, equity securities, market, operational, index tracking, authorized participant concentration, no guarantee of active trading market, trading issues, passive management risk, fund shares trading, premium/discount risk and liquidity of fund shares, non-diversified and concentration risks, all of which may adversely affect the Funds. Foreign investments are subject to risks, which include changes in economic and political conditions, foreign currency fluctuations, changes in foreign regulations, and changes in currency exchange rates which may negatively impact the Funds’ return. Small- and medium-capitalization companies may be subject to elevated risks. The Funds’ assets may be concentrated in a particular sector and may be subject to more risk than investments in a diverse group of sectors. Please call 800.826.2333 or visit vaneck.com for performance information current to the most recent month end and for a free prospectus and summary prospectus. An investor should consider a Fund’s investment objective, risks, charges and expenses carefully before investing. The prospectus and summary prospectus contain this as well as other information. Please read them carefully before investing.